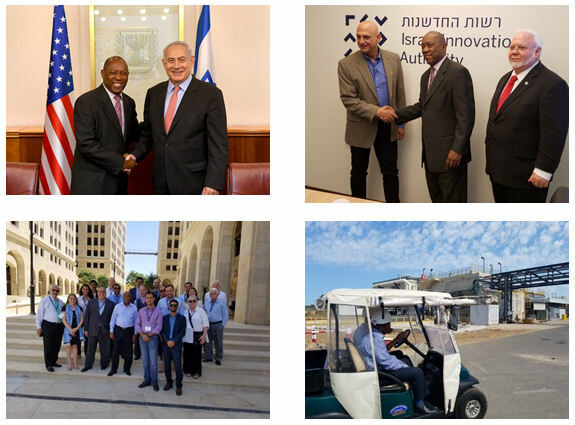 June 29, 2017 -- Mayor Sylvester Turner’s vision for Houston as a high-tech innovation hub took several steps forward after a successful economic development and trade mission to Israel recently. A private meeting with the Israeli Prime Minister Benjamin Netanyahu sparked a discussion regarding healthcare data mining and personalized medicine. Meetings with the minister of Energy and Infrastructure and the mayors of Jerusalem, Tel Aviv, Beersheba and Al-Bireh focused on Smart City management, energy connections, cyber security and tourism. City Council Member Michael Kubosh and a delegation of business and nonprofit leaders from Noble Energy, Braun Enterprises, Lone Star College System, Texas Medical Center, Houston Airport System, Visit Houston, Kinder Institute, ChaiOne, INVICTUS, Precision Task Group and Winstead PC accompanied Mayor Turner. Connecting the people, businesses, cultures and economies of the world to Houston and the region also included traveling to the Palestinian territories. The delegation visited with the mayor of Al-Bireh about infrastructure, walked through the Al-Amari refugee camp and toured a clinic which sees 300 patients a day. The group also met with the founder of the growing city of Rawabi. During the mission, Mayor Turner and the delegation also met with local Israeli entrepreneurs who are doing business in Houston. A new alliance was also announced between MD Anderson Cancer Center and Israeli company Convergent R.N.R. which will develop new radiation technology. More partnerships and alliances are on the horizon in the fields of cyber security, life sciences and tourism. Houston and Israel have a shared belief that innovation, creativity and progress require positive leadership, thoughtful inclusion of our citizens, discipline and hard work. The delegation came away with a renewed sense of purpose and optimism for the future of Houston knowing that we have all the resources and people to improve our great city.